2015 Lexus NX Pros and Cons: Why (Not) This Car? The appeal of a car-based SUV seems obvious in hindsight, but neither the American nor the European auto makers were among the first to cobble together such a beast. Instead, Toyota created the first crossover, with the 1996 RAV4, and then the first premium crossover, with the 1999 Lexus RX 300. Everyone else then scrambled to respond (albeit some with more alacrity and success than others). In the years since, though, Toyota has become much less likely to be the first, or even anywhere near the first, to enter a new category. Honda introduced the first three-row premium crossover, the Acura MDX, as a 2001 model. A response from Lexus has been rumored for years, but has yet to appear. With the compact premium crossover, Toyota has managed to be both first and among the last. The RX was originally compact in size, but gained a half-foot of length with its first redesign, for 2004. It grew a couple more inches with a second redesign, for 2010--at which point crossovers about the size of the original RX, exemplified by the Audi Q5, became the Hot New Thing. With the RX too large to compete with the Q5 et al. directly, the folks at Lexus...engaged in immediate discussion. For 2015, Lexus once again has a compact premium crossover, the NX. By studying what everyone else did, and who won and who lost the contest for buyers, Lexus could have learned how to make the best of the bunch. But have they? Since the Audi Q5 is due, even overdue, for a full redesign, I'm pitting the new Lexus NX against another recent entrant, the Lincoln MKC (previously reviewed against the disappointing Acura RDX). The NX's interior is as edgy as its exterior. Nicely finished. Why the 2015 Lexus NX? As a rule, all-new cars aren't the best bets for reliability. But one reason Toyota has become so slow to join new trends is it doesn't want to jeopardize a reputation that took decades to build, and that was threatened not long ago by the unintended acceleration fiasco. The Lexus NX 200t is powered by Toyota's first turbocharged gas engine since the 1990s, and Lexus's first ever. But this new engine has no doubt been subjected to some of the most thorough testing in the history of the industry. Just about everyone not Japanese, including Ford / Lincoln, introduced a 2.0-liter turbocharged four-cyinder engine much earlier. The new engine, like those in competitors, is direct-injected, meaning that fuel is injected under very high pressure directly into the combustion chamber, rather than into the intake. But, unlike other direct-injected engines, the Lexus engine retains a second set of injectors in the passe intake port location. One advantage of this costly approach: port injectors spray their fuel onto the backsides of the intake valves, preventing the carbon buildup that has all too often afflicted Audis. New design with a new engine notwithstanding, many people will buy the Lexus NX instead of something else because they expect it will prove more reliable down the road. Based on our reliability data for other Toyota and Lexus models, I don't think they will be disappointed. And the Lincoln MKC? It's still early, but the data we have so far does not bode well. Even upscale manufacturers have been shifting from V6 engines to turbocharged fours for one big reason: the imperative to improve fuel economy. The Lincoln MKC's EcoBoost four isn't long on eco. With front-wheel drive (FWD), the 240-horsepower 2.0T engine scores 20 and 29 mpg in the EPA's city and highway tests, respectively. But these figures drop to 19/26 with all-wheel drive (AWD) and 18/26 with a 285-horsepower 2.3T engine option. The Audi Q5 2.0T, with standard AWD, does a bit better: 20/28. The 235-horsepower Lexus NX 200t does a bit better still, at least in city driving: 22/28 with FWD and 21/28 with AWD. In my real-world suburban driving I could nudge the trip computer-reported average as high as 33 mpg. The upper 20s were easy to achieve. The trip computer averages in the MKC were typically about three mpg lower--even though the tested crossover did not have AWD. If fuel economy is a top priority, then Audi, BMW, and Mercedes-Benz offer diesels. The Mercedes-Benz GLK250, with EPA ratings of 24/33, much more easily topped 30 mpg in my suburban driving, and averaged 40 mpg on one run home from my son's school. The BMW X3 xdrive28d tested even better, 27/34. To counter these diesels, Lexus also offers the NX in 300h form, the "h" for hybrid. I haven't driven the NX 300h, but the EPA rates it 35/31 with FWD and 33/30 with AWD. People who don't care for the NX's face will prefer this angle. Any resemblance to a cockpit is purely intentional. The touchpad needs to be easier to use. Lexus, distressed by the advancing age of its customer base, has been making the styling of its cars edgier and edgier. The NX, a melange of angles, is the edgiest yet. I'm not personally a fan, in part because the crossover's front overhang appears excessive to me (for no obvious functional reason). But some people find Lexus's latest highly appealing. While we were stopped at a light in neighboring lanes a woman driving her husband's Range Rover (the big expensive one) asked me how I liked the NX. She was thinking of getting one. When I suggested that she also take a look at the MKC, she replied that the Lincoln's styling wasn't sporty enough. She much preferred the exterior of the NX, which inarguably stands out far more in traffic. Given the applies and oranges nature of this comparison, I haven't rated them against each other. The in-your-face aesthetics continue inside the NX. While the MKC's interior is easier on the eyes, with clean, emotionally soothing lines, the NX's instrument panel and seats look sportier. At least the various details, including yards of de rigueur stitching, are more tastefully integrated than in some other recent Lexus interiors. In F Sport form the Lexus NX is fitted with aggressively bolstered front bucket seats that provide considerably more lateral support than the front seats in the Lincoln. As long as your torso fits easily between these bolsters, comfort is also very good, with cushier padding than you'll find in German competitors. The MKC's seats fit my particular form a little better, though. Lexus first made a name for itself by developing cars with an unexpected level of refinement. Their smoothness and quietness compelled other auto makers to make minimizing NVH (noise, vibration, and harshness) a top priority. Some recently updated Lexus cars haven't inspired analogies to tombs the way their ancestors did, perhaps because Toyota has been striving to make them seem sportier. The new NX, though, ranks with the Lincoln MKC among the smoothest, quietest compact crossovers. Wind and road noise might be a little higher in the Lexus, but its engine is quieter--unless you turn on "active noise control," which plays artificial engine noises through the audio system during hard acceleration. Why Not the 2015 Lexus NX? Like everyone else, Lexus has been trying to figure out how to make an increasing number of infotainment functions easy to operate. Unlike everyone else, their solutions have involved computer-like interfaces. The mouse-like "remote touch" controller introduced with the 2010 RX has inspired few fans. 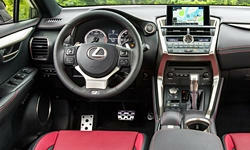 With the NX, Lexus is trying something different, a small touchpad on the center console. Even at the end of my week with the car I avoided using this touchpad. I found it much harder to operate than the mouse-like thing it is replacing, much less the knobs employed by the Germans. It needs to be easier and more intuitive to not be distracting. The F Sport's suspension might be firmer than that of the regular Lexus NX, but the crossover's dynamics remain short of sporty. While the NX doesn't embarrass itself when hustled, it also doesn't ask to be hustled. Thanks to quicker steering and more aggressive torque vectoring (selectively applying the brakes to rotate the vehicle), the Lincoln MKC, while not exactly sporty itself, feels more agile and engaging. The Lincoln also maintains its composure better over uneven road surfaces. Though the Lexus doesn't bobble and heave much, either, the Lincoln just feels right, and I enjoyed driving it more. If the previous match-up had been a three-way, the Lexus still would have placed well ahead of the Acura RDX in handling. The Acura's steering feels far too light, and its body motions over imperfect pavement can seem unpolished. The Lexus has firmer, marginally more communicative steering, especially in "sport" mode. The F Sport gets a more aggressive version of Lexus's "spindle" grille. Any fans? Any at all? NX's back seat is roomier than the MKC's. If you want more, you're looking in the wrong segment. You can get the latest safety tech on both the Lexus and the Lincoln. Okay, you can't get lane departure warning on the F Sport, but it's the least useful and most annoying of these features. Of much greater concern, you cannot get leather upholstery (only synth hides) or ventilated front seats on the F Sport, only on non-F'd NXs. And you can't get a panoramic sunroof or a heated rear seat on any NX. In the styling department, the largest wheels are 18s, while the Lincoln is also available with 19s and 20s. The Lexus NX 200t doesn't feel as quick as it is, and by current standards it's only passably quick. Figure high 7s for a run to 60 mph. The Lincoln is about a half-second slower with its base engine and about a half-second quicker with its optional one. In typical daily driving there's only a hint of turbo boost lag from time to time. The best turbo fours feel a little more seamless. This modest amount of lag and some vibration at idle aside, the NX 200t's powertrain is a model of refinement. Initial acceleration from a dead stop has a hybrid-like smoothness. The transmission's shifts are barely perceptible. Throw the throttle wide open, and engine noise remains so low that Lexus felt the need to provide the ability to artificially add some. Turn up the "ASC" dial, and the song of the turbo four gets Auto-Tuned into that of a V6. These aren't large vehicles inside. But the Lexus NX's rear seat does include about three more inches of rear knee room than the Lincoln MKC's does. Don't let nearly identical legroom specs fool you; Ford has been cheating these by sliding the front seat forward between taking the front and rear measurements. (TrueDelta deducts two inches from the official front legroom spec to provide an accurate comparison.) At 5-9, I can barely fit behind myself in the MKC, yet I have a few inches to spare in the NX. Neither rear seat is mounted high enough off the floor to provide adults with thigh support. When similarly equipped, the Lexus NX 200t and Lincoln MKC have similar bottom lines on their window stickers (starting prices in the mid-30s, as-tested prices in the mid-40s), but the Lincoln includes about $3,500 of additional content, so it would strike me as the better value if it wouldn't depreciate much more rapidly. But it almost certainly will. Since the Lincoln seems the best value initially, but the Lexus could easily prove a better value over years of ownership, I haven't rated them against each other in this category. The new Lexus NX looks exciting, but it doesn't drive nearly as exciting as it looks. Maybe this is okay. More people want an edgy look than want to live with an edgy chassis. Even in F Sport form the NX largely delivers the smoothness and quietness that originally exemplified the Lexus brand. But the trade-off between fun and comfort isn't absolute. The Lincoln both rides more comfortably and handles more sportily. For the sort of person drawn to the idea of a sporty Lexus, it provides a nearly ideal balance between ride and handling. But the MKC doesn't look as sporty, its back seat is much tighter, and it isn't likely to be as reliable, especially after the warranties end. In the final analysis, Lexus hasn't delivered a new product that stands out in any particular way (with the likely exception of reliability). But neither does the new NX have any major flaws, so perhaps Lexus did learn from others' mistakes. Overall, the NX is very much a Lexus, with edgier styling. Decent performance, good fuel economy. A respectable first direct-injected turbo four. Seat doesn't fold quite flat. Lexus and Lincoln each provided an insured vehicle for a week with a tank of gas. Richard Wolf (248-354-4900) of Star Lincoln in Southfield, MI, helpfully provided another MKC for a comparison drive the week I had the NX. 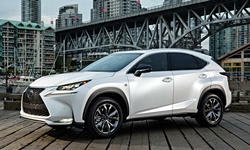 2015 Lexus NX pros and cons, according to Michael Karesh: the best reasons for buying (or not buying) the 2015 Lexus NX. Join TrueDelta to post your own impressions.